At the breastfeeding festival, where I recently read some of my poems to an appreciative audience, I heard a talk from Chrissy Chittendon, author of Attachment Feminism. She covered some points I had never thought of before. One of the things she said which struck me was that no-one celebrates a woman’s post-natal body and society’s emphasis is to ‘get back to normal’. But a woman’s post-natal body IS normal. When you have carried a child in your womb, the body is changed forever. It enters a new phase of existence. The womb never goes back to its pre-used state, like a balloon that has been blown up cannot return to its former tightness. The evidence of child-bearing is written on the body forever. I wish someone had told me my breasts might leak or be engorged. The lustrous hair of the last months of pregnancy lost its volume. My belly was almost as large as when pregnant, but soft and empty. I continued wearing pregnancy clothing as at first, nothing else fitted. However, none of this bothered me. My body was a soft cushion for my gorgeous daughter. My cuddliness comforted her. It is a bodily state we ought to celebrate. And it is temporary. In the scale of things, it’s fleeting. Could it be nature’s design that the first few months after birth give us these baby-friendly bodies? Between babies, my body did return to normal, without my doing anything in particular to help it do so, though admittedly I was a stone heavier than before my first. I was in my young mother body, one equipped for the job I was doing: a comfortable knee to climb on, a soft place to rest a child’s head. I knew my body so well by then, I was able to tell very quickly when I was expecting a second child. I could smell it and feel it. I was in tune with it. My older child was told every stage of ‘our’ baby, so much so that when she came into hospital to meet the new baby, she demanded to know, aged three years four months, whether I had seen the placenta and whether my milk had come in yet. My new self-knowledge opened up new places in my writing. Self-acceptance is very important, whatever the media pushes at women to have ‘perfect’ bodies. In reality, the perfection is about function, not aesthetics. I believe our bodies, like our faces, are all the better for being lived in. I confess I was one of the lucky ones. I have no stretch marks on my belly, no scars from sections. But I do have stretch marks on my legs. I wrote this poem in celebration of stretch marks. They are normal and beautiful. crept into the house, tasting the night silences. I will wear them all my life. This pamphlet, beautifully produced by Mother’s Milk Books, is a delight. I read it in one sitting but will be going back to savour its imagery and crafting in the future. The first poem, ‘Eucharist’ is a hymn to a mother’s love. It neatly subverts the religious element which is so often controlled by men, into an intimate ceremony of women, a mother making porridge for her daughter on mornings she feels well enough to do so. This gives the lie to deluded people who think domestic imagery is cosy – it is anything but. I also like the way Cherriman uses the sofa as a symbol of the relationship. A sofa is where one cuddles up to breastfeed, read and cuddle. Now the sofa is not big enough to hold both of them: the notion captures the boy’s growth but also the space he now requires to detach from the mother’s love. through thorns to kiss those lips. But still I cannot rouse her. One of the stand-out poems for me in this pamphlet is ‘The Foster Mother’s Blanket’. Apparently foster parents sleep with a blanket to give to the child when he or she moves on to a forever home, so that they have the familiar smell to comfort them when they leave. Cherriman makes it a symbol for memory and futures unknown, for love, for history shared and severed, and for promise. ‘Pamela’ is a story of a woman, not perfect, not always likeable, but who would not give her illegitimate baby up for adoption, that mother-love redeeming her faults. ‘In Bloom’, the closing poem which explores the story of Alice Scatcherd, was commissioned by Morley Literature Festival. Rightly placed at the end, it is a poem of consolation and hope. The pamphlet is £5 from Mother’s Milk Books, or from Becky Cherriman herself. Five Leaves bookshop stock it also It is highly recommended. There has been a lot of discussion recently on how poems which rely heavily on others should be attributed in work that follows it. There are people who say they work from a starting point of someone else’s poem and change words until they make it their own. I do not see that as creating, but learning how to write, and not to write something that could be submitted for publication. Poet means ‘maker’, not ‘alterer’. Those who aspire to write poetry must read it and aim to learn from poets who have spent time learning their craft. Expertise cannot be gained overnight: it comes from years of practice and reading, experimentation and critique. Those who have immersed themselves in poetry absorb much. They don’t sit and write with other people’s poems to paste in or alter, unless they are doing cut ups and collages – and in that case they do make things anew, and they credit their sources. When I write ‘After’ under the title of a poem of mine, I am acknowledging a starting point that has come out of poems I internalised long ago. Philip Larkin’s ‘The Whitsun Weddings’ is about a train journey across England in which he observes many newly married couples getting on to the train at various stations. My own poem, ‘Spring Lines’, which I share below, nods towards this poem, as I am expecting the reader to make a link between the Larkin piece, one of the most well known poems of the last century, because I too am meditating on something observed from a train I am travelling on. I do not borrow a single image or phrase from Larkin; my train journey, like his, was real. So embedded is his poem in our collective consciousness, that I doubt I am alone in being reminded of ‘The Whitsun Weddings’ anytime I take a train across country in spring. I write ‘After’ both to acknowledge that poem as a reference and to make the reader think of it as a kind of response. I do not take Larkin’s verse and change ‘bride’ to ‘washing’ or any such reductive method of composition. My structure, verse form and rhythm are my own, my ideas are my own, my imagery is mine. I did not have Larkin’s piece in front of me at any point; I had it in my mind as an echo, a fellow-feeling. 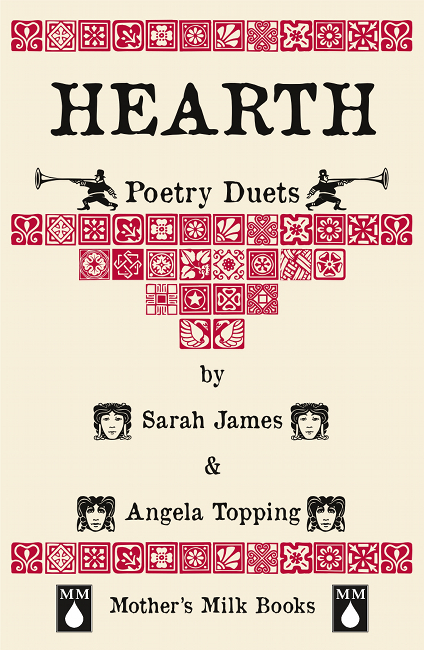 This poem was recently published in Hearth (Mother’s Milk Books), a poetry duet in which Sarah James and I respond to each other and interleave our poems. I share my example because I can do so without infringing copyright. There are many thousands of poems which use ‘after’ to acknowledge what has gone before. That is its proper usage, NOT as an apology for misusing someone else’s sweated-over words.